Summary: "Humans and androids crowd the raucous streets of New Beijing. A deadly plague ravages the population. From space, a ruthless lunar people watch, waiting to make their move. No one knows that Earth’s fate hinges on one girl. . . .
First line: "The screws through Cinder's ankle had rusted, the engraved cross marks worn to a mangled circle." Thoughts: First of all, I have to say that I love retellings of stories I grew up with. Now, add a dystopian take on it, and you have a book that's made of win. In Cinder's case, it brought back memories of the classic tale, but adds it's own modern twist. It's strange, full of drama, and most importantly, good! I'll admit, when I first started reading Cinder, I had a difficult time relating to the story. At times, I even had difficulty following it. After all, I don't live with cyborgs so how am I to know what they look like or how they function? As the story progresses, however, you begin to see that cyborgs aren't just half human-half machine beings, but second class citizens. Some people even look at them with disgust. In Cinder's case, even though she is one of the best mechanics around, people still look down on her because of her half mechanical nature. She can't even count on her "family" with the exception of one of her younger step sisters. Then, one day, Prince Kai wanders into her store, and her life changes. Whether for better or worse, you'll have to read it to see. My favorite thing about this book has the be the creativity and imagination Meyer uses to weave her story. No one out there can argue that this book isn't 100% original. Meyer thought outside the box, and the story really paid off. I loved the idea of using a futuristic China as the setting. China's a beautiful country and definitely somewhere I'd love to visit one day. I will say I would've liked to see more description as far as the setting goes. You know it's China because they're in "New Beijing", however, they could've been anywhere in the world. What makes this place New Beijing? Heck, what makes it different than where I live? I really hope the sequel answers these questions for me. Let's talk about romance. The romance factor is definitely there, but it's also light. After all, this is just the first book. You can't throw all your chips in one hand! I adored Prince Kai and found him very lovable. He's not necessarily swoon-worthy, but he definitely has potential. Overall, I really enjoyed Cinder's tale. I will admit that I saw the ending coming, though it doesn't take anything away. Folks, there is a cliffhanger so prepare yourselves for that. 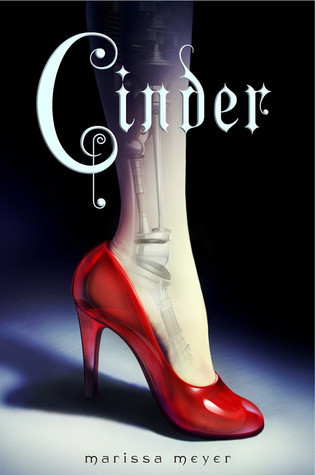 I very much look forward to Cinder's sequel and any other books written by the fabulous Marissa Meyer. After reading this review, I'm looking forward to reading this book even more! My review is going up soon and I mention some of the things you did. I do wish there was more about New Beijing. Such a cool setting but it didn't feel like anywhere special - just generic. To me anyway. Like you, I also enjoy a good retelling :) Cannot wait till I get my hands on Cinder. Let me ask you something; I've read many reviews on the story itself and how good the plot is, but what about the romance? was it any good? I'm a sappy romantic :)haha! Awesome review, lena! The blogs are going CRAZY with this book. I can't wait to read it! Eeeek! I just bought this one and i'm so excited to get to it. It does sound super imaginative and creative I can't wait! Wonderful review! I bought this last week, and I really want to get to it, but there are other books that I feel like I need to read first. I think I need to spend less time on twitter and more time reading some of the piles of books I just got haha! Fantastic review! I have heard such great things about Cinder (and I appreciate your review, and your saying that it starts a bit slower.) I have a copy of this one on my Kindle, so I think I'll be reading it soon. Great review, this sounds wonderful! I really need to pick up my copy soon. I really liked Kai too-such a sweet and responsible guy. Hope we'll be seeing a lot of him in the next book! Ahhhh, Lena!!! <3 I have to admit that anything to do with fairytale re-tellings automatically make my TBR list too, but now I think I might add this to my To Buy list! I actually had no clue that it was a dystopian before! And since I'm going through a major dystopian phase, it makes me even more excited to read this book! Glad to see you enjoy this one as well! I really liked how creative and unique this book was, and I agree on your point about the cyborgs- it was kind of hard for me to imagine them at first too. Great review!